So she decided to send me to piano lessons. I’m still not sure how she made the link between terrible singing, dancing and piano lessons as a solution, but what I do know is that my singing never improved. This however, has never stopped me from loving to sing, or trying to sing. 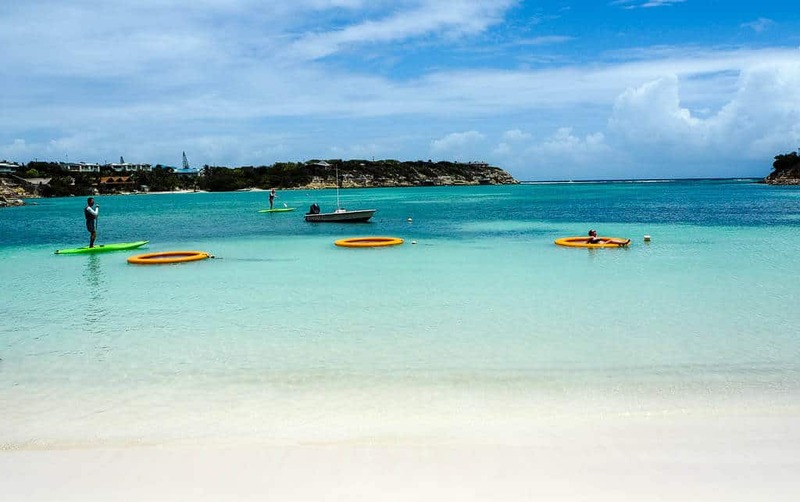 It turns out that the dream would come true in one magical week we spent in Antigua. Is there such a thing as singing holidays? YES THERE IS! Before our trip my visions of Antigua consisted of emerald blue seas, white sandy beaches, and colourful cocktails. The sounds I heard in my head were steel drums and reggae beats. 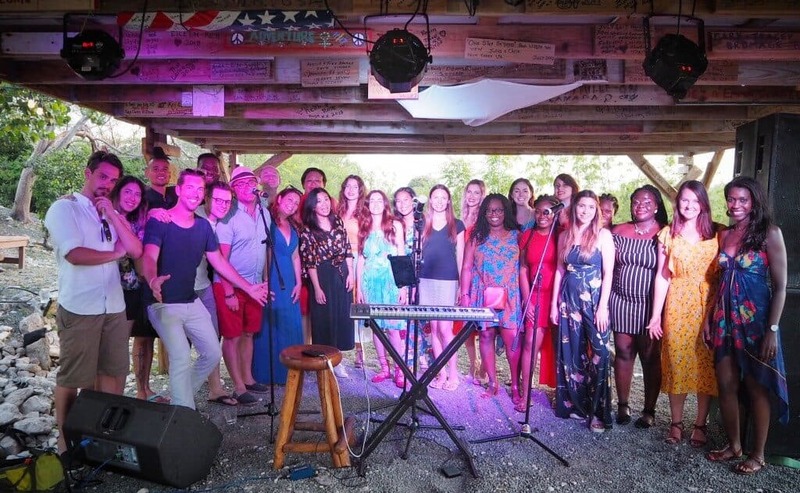 So it was a huge surprise that the highlight of our week would end up being the choir singing lessons we had at the Pineapple Beach Club. 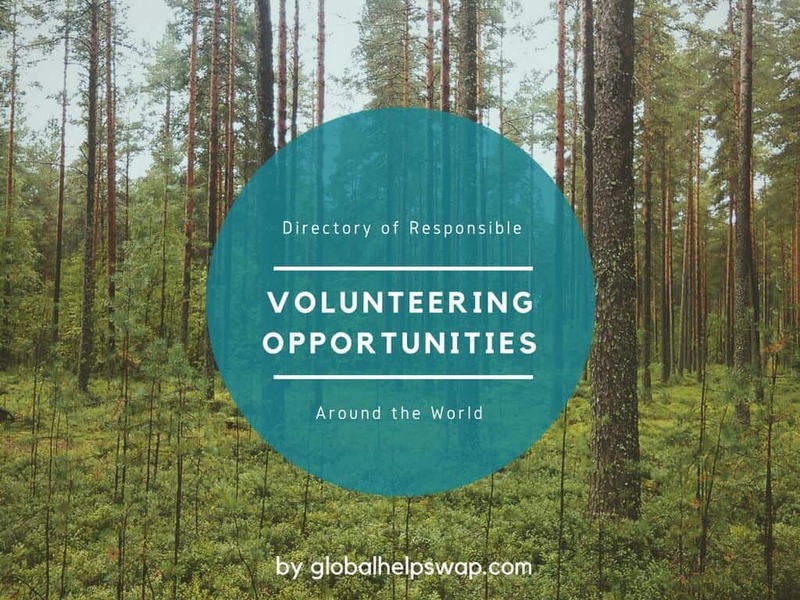 So if you’ve never heard of singing holidays read on to find out more about what they are. Only the choir took us away from this beach. 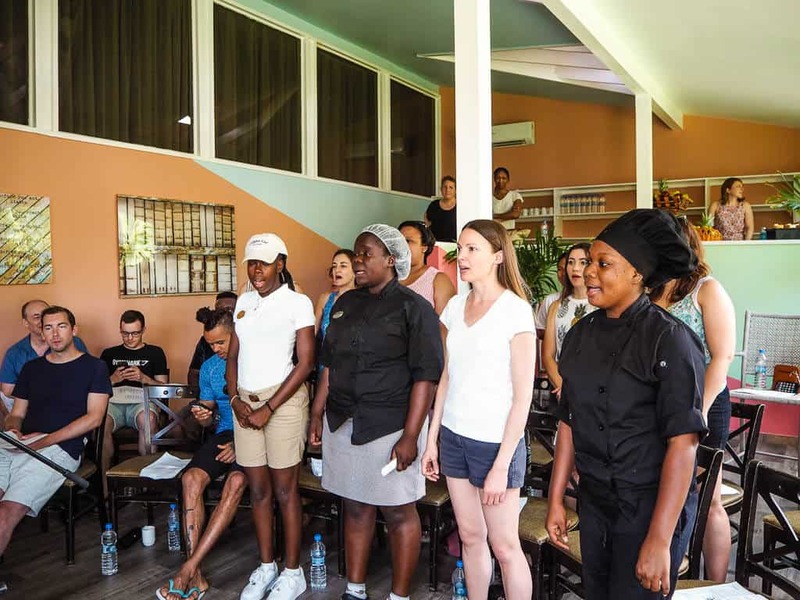 To give you some context, a genius at Elite Island resorts (a company that owns some of the most beautiful resorts in the Caribbean) decided to offer choir singing lessons in their all-inclusive package, helping travellers combine a Caribbean holiday with a singing holiday. Not ones to do things in half measures they partnered with one of the most amazing voice coaches on the planet, Mike King. Mike has worked on The Voice and with British stars like Lili Allen and Florence Welsh. Besides being super talented he’s also a hugely genuine nice fun guy with a big love for teaching people to sing. When Paul and I signed up for the choir lessons we were not really sure what to expect. Our main thought was that since the lessons were 90 minutes long they wouldn’t be taking away too much beach time. We joined 20 other budding singers for our first lesson and within minutes I learned why I sounded so terrible when I tried to sing. 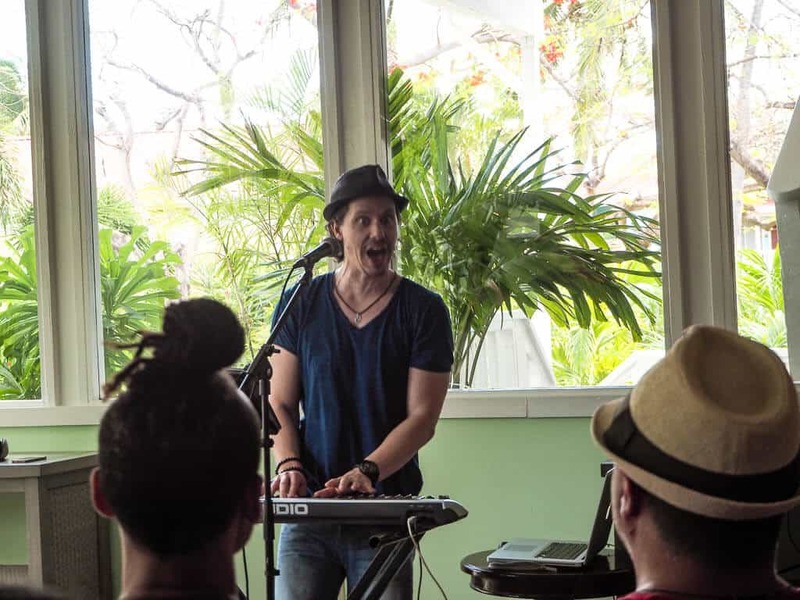 I was using a vocal range that wasn’t natural for me. It turns out that when we sing we can sing in three different ranges – soprano (high) alto (medium) and tenor (low). I could instantly feel that my voice was best suited to the alto range whereas for all my life I’ve tried to sing in soprano. We started we some breathing exercises that taught us how to use our breath properly. I went from singing a note for 2 seconds before losing breath to taking it all the way up to 10 seconds. With such fast progress our confidence shot up. Mike was absolutely brilliant at helping us relax and enjoy ourselves. He flattered us consistently and gave us a ton of pointers that made a huge difference to how we sounded. I loved hearing the progress I was making (at least to my ears anyways). I was amazed at how much better I could sound by making a few changes in the notes or even in the volume of my singing. It was a wonderful feeling hearing 20 voices come together going low at first and then rising high at the end of the chorus. It made the hairs on my neck stand on end. There is something really powerful about creating music with other people. We all bonded so much as a result of the choir, which ended up making the whole trip even more special. We’d always be surprised at how quickly the time seemed to vanish. Although with a combination of singing and laughter it’s easy to see why we all loved it so much. 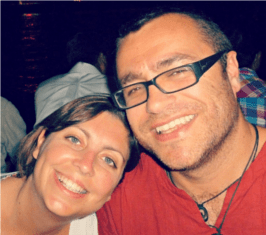 After just 3 lessons we learnt how to sing 4 beautiful songs in a way that did them justice. We were ready for the grand performance which would happen at the final bar-b-q party of the week. I felt such a rush of excitement and nerves before the performance started. I was scared I would forget the lines or get them wrong, but Mike quickly put us at ease with one final practice and loads of encouragement. And then the audience arrived. We sang our first song to cheers whoops and wows from the audience. I felt tingles all through my body and my grin was totally bigger than a Cheshire cat’s. You could feel the joy coming off everyone in the choir, and by the time we finished our fourth song we were all jumping up and down, hugging each other. One friend (who shall not be named) came up to us with tears streaming down his face. He was THAT impressed. As for me, I just basked in the feeling of having checked off one of my biggest dreams to sing in front of an audience. Not only did I do it, but I also did it in the most beautiful setting I could have ever hoped for. My favourite thing about travel is that I get to create awesome memories that stay with me for ever. I know this particular memory will bring me a lot more smiles for years to come. 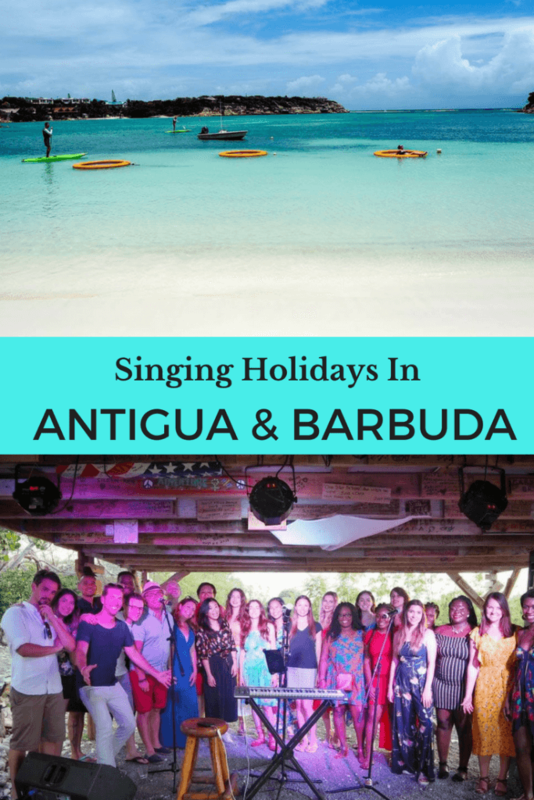 If you also love singing (and trust me, you really don’t need to be good at it) do not miss this activity on your holiday to Antigua. 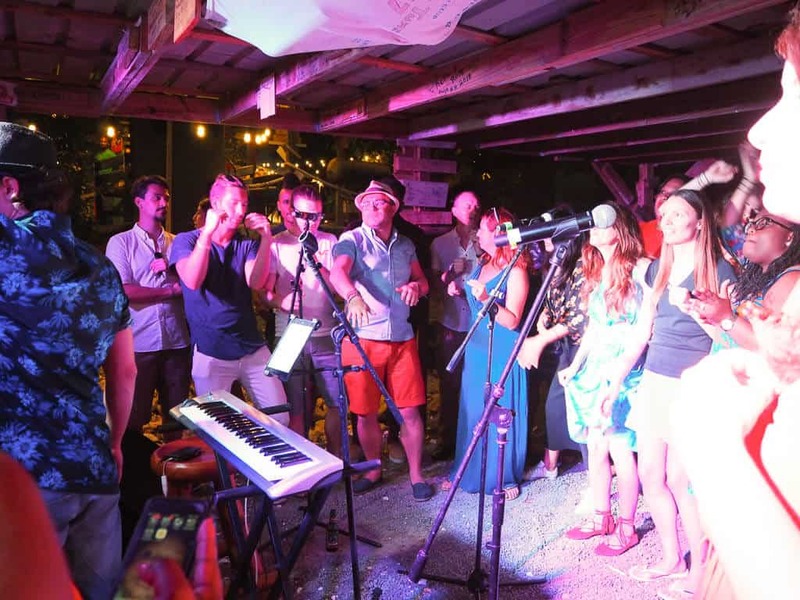 Make sure you stay at the Pineapple Beach Club or The Verandah Resort and your choir lessons will be included in the price! 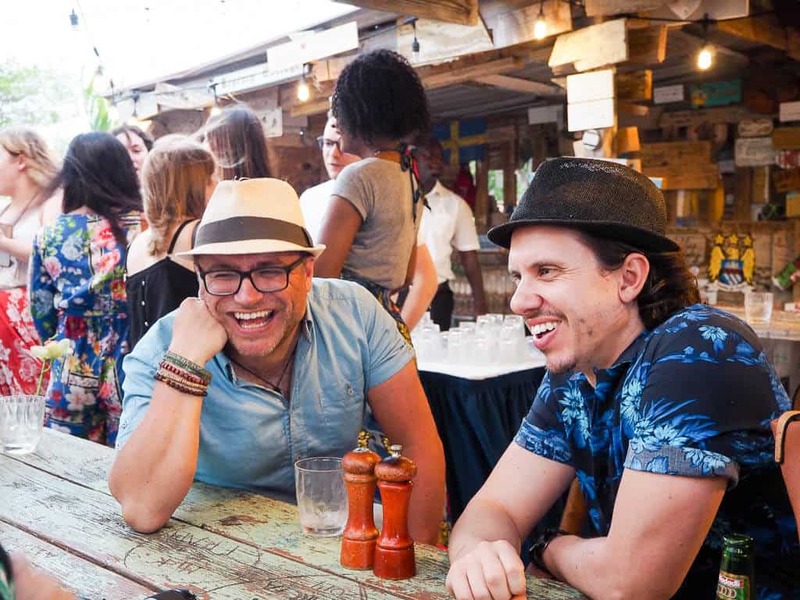 Check when and where Mike will be coaching a choir by clicking here to make sure your trip coincides with the time and place of the next choir. We travelled courtesy of the Antiguan Tourism Board & Elite Island Resorts. As always opinions are our own.